The other day we found ourselves at a fabulous RV dealership in Missoula, Montana: Bretz RV and Marine on I-90. This is a huge place that has a mammoth inventory of trailers and motorhomes that spills over several lots. What a great spot to go RV shopping! We LOVE RV shopping and have been at it since before we started traveling full-time! But what brought us here? Well, the 99 cents per gallon propane deal they are offering was one thing, and the free and extremely well laid out RV dump station was another. What a place! After we’d dumped and gotten our propane, we decided to have a look around the RV lots and check out some of the very pretty RVs. 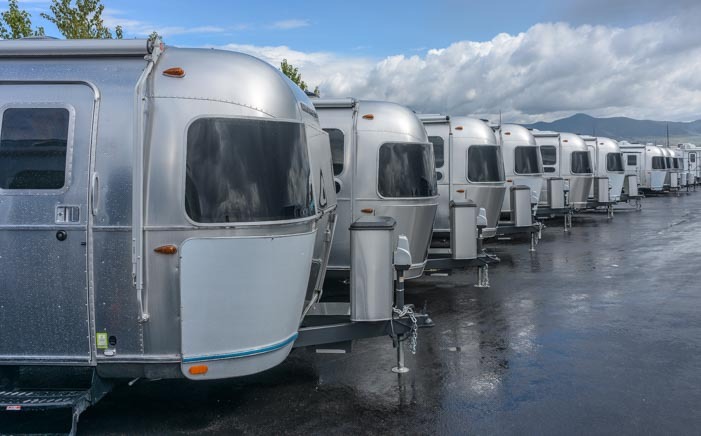 Bretz has an enormous selection of Airstream trailers, and we got a huge kick out of seeing a few up close. Beautiful! How fun it was to prowl around these classic Airstream trailers. I have written a little about what to look for in an RV for full-time living, and one of the things that a lot of new RVers don’t realize when they go shopping is how important it is to get a trailer with an adequate Cargo Carrying Capacity. Cargo Carrying Capacity is the difference between what the RV weighs when there is nothing in it (the “Unloaded Vehicle Weight” or UVW) and what it weighs when you have loaded it down with all of your personal belongings plus food, water and propane as well as upgrades like solar power, washer/dryer, a big battery bank, a generator, a bike rack and bikes, etc., (the “Gross Vehicle Weight” or GVW). It is important not to exceed the Cargo Carrying Capacity! 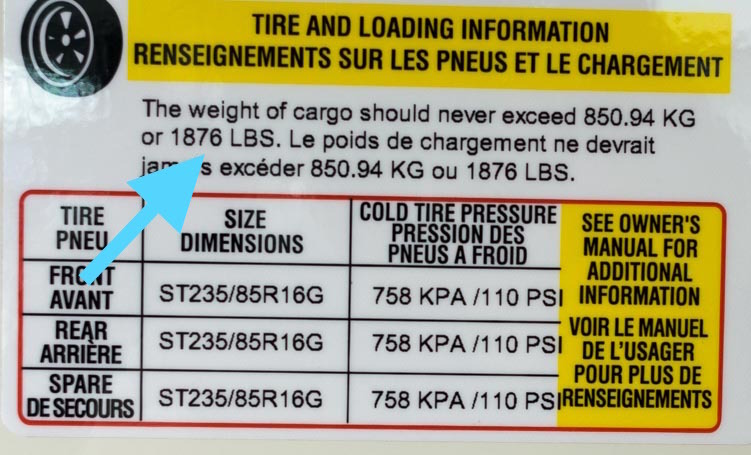 If you do, then you’ve gone over the trailer’s GVWR (“Gross Vehicle Weight Rating”) which is the maximum safe weight for the trailer when it is fully loaded. On older trailers the GVWR is posted on a sticker that is placed on the outside of the trailer up near the front on the driver’s side. On newer trailers there is usually another sticker that indicates the Cargo Carrying Capacity. 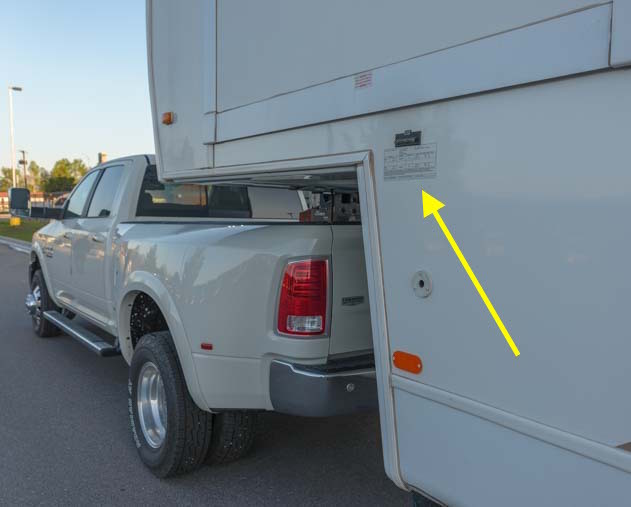 A sticker for the trailer’s weight capacities is usually on the driver’s side up by the hitch. A few weeks after we moved into our 36′ Hitchhiker fifth wheel trailer back in 2008, we took it to a truck scale. We reported on this blog at the time that it weighed 13,850 lbs. This was close to the trailer’s GVWR of 13,995, but not over. Phew!! We had lived in it a very short time and had filled the cabinets only 1/3 of the way! 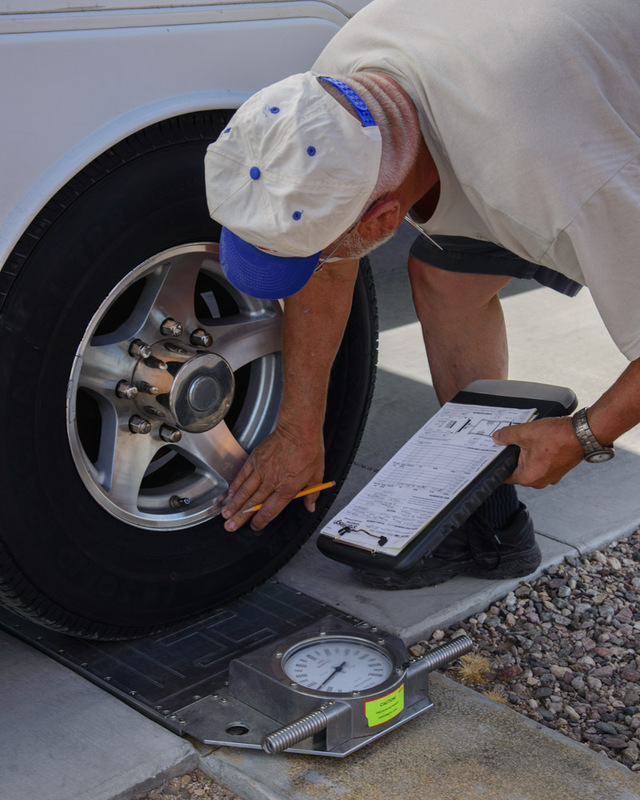 Right after moving into our new fifth wheel in 2008 we hopped on a scale to see what it weighed. After we finished our sailing cruise of Mexico in 2013, we had to squeeze our lives back into our trailer, and we had a tough time getting rid of all the wonderful things we’d picked up from sailing. 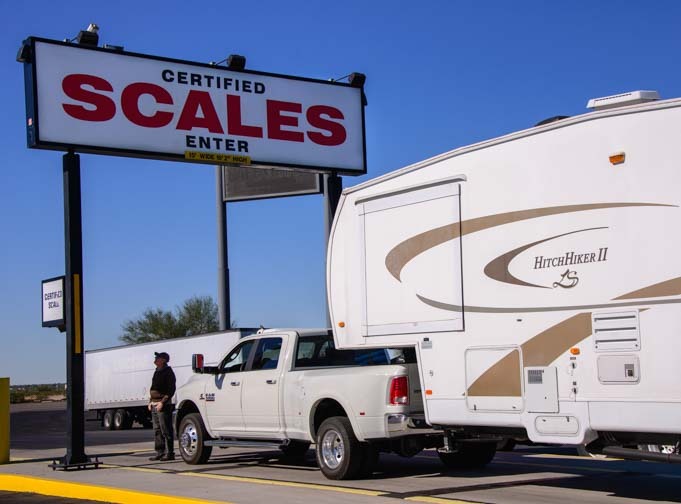 So we had our trailer weighed using the Escapees Smartweigh Program at the Escapees RV park at North Ranch near Wickenburg, Arizona. Our trailer had gained 250 lbs. and now weighed 14,100 lbs. The weight on our rear axles was 11,250 lbs. The trailer was built with two 7,000 lb. axles. It also came from the factory with E-rated (10-ply) tires that were rated to carry 3,032 lbs. apiece, or 6,084 lbs. per pair on an axle. When it comes to GAWR (“Gross Axle Weight Rating”), the axles are rated according to the weaker component, whether it is the axles or the tires. So our GAWR was 6,084 lbs. due to the E-rated tires. However, by upgrading to G-rated (14 ply) tires that are rated to carry 3,960 lbs. each, or 7,920 lbs. all together, the weak link became the axles themselves rather than the tires. So our GAWR was now 7,000 lbs. due to the axles. Either way, the 11,250 lbs. actual weight we had on our axles was well within both the original axle rating of 12,780 lbs for the pair (6,084 per axle x 2 axles = 12,780) and the new axle rating of 14,000 lbs for the pair (7,000 per axle x 2 axles = 14,000 lbs). In 2013 we began to worry about the battle of the bulge. Our Escapees Smartweigh weighing revealed that our old 2007 Dodge Ram 3500 single rear wheel truck was overloaded. After we upgraded to our new 2016 Dodge Ram 3500 dually, we went to a truck scale two more times to see how we were doing. We knew the trailer weight was well within the towing capacities of the new truck, but we had had to replace a trailer axle in August 2015 and then replace the entire trailer suspension (ugh!) in October of 2015. Needless to say, we were concerned about the weight on the trailer axles. When the trailer was weighed this time around, the weight on the trailer axles had increased to 11,600 lbs., 350 lbs. higher than two years earlier, but still well within the limits of the 14,000 lbs. that the axles and tires could carry. Mark gets the low-down on our truck and trailer weights. We didn’t weigh the truck and trailer separately, so we don’t have a figure for the overall trailer weight yet. However, my suspicion is that the extra 350 lbs. on the axles means our 14,100 lb. overall trailer weight has increased by 350 lbs. to about 14,450 or so. This means the trailer is 455 lbs. or so over the its GVWR of 13,995 lbs. Despite having many cabinets that are only partially full, our trailer is over its weight limit! Besides being overweight, we’ve learned something important from this. The UVWR (“Unloaded Vehicle Weight Rating”) on our trailer is 10,556 lbs. Since 13,995 GVWR – 10,556 UVW = 3,439, this means the Cargo Carrying Capacity of our trailer is 3,439 lbs. That’s a little above average for most fifth wheel trailers. However, if our trailer’s true weight is now 14,450 lbs., then the cargo we are actually carrying weighs 3,894 lbs (because 14,450 True Weight – 10,556 UVW = 3,894 Actual Cargo Weight). A few weeks ago (in March 2016) we were back on the scales again. So, what this means is that for us to live in our trailer comfortably over a period of many years, as we have done, we need a trailer with a Cargo Carrying Capacity of around 4,000 lbs. Other RVers may have different requirements. Frankly, if we were to buy a new trailer, we would be looking for a Cargo Carrying Capacity of at least 5,000 lbs. We dry camp 100% of the time, so we always tow the trailer with the fresh water tank full (since we will need a full tank when we set up camp). Water weighs 8.3 lbs. per gallon. So, our 70 gallons in the fresh water tank and 10 gallons in the hot water heater, weigh 664 lbs. Our waste tanks are empty when we travel. 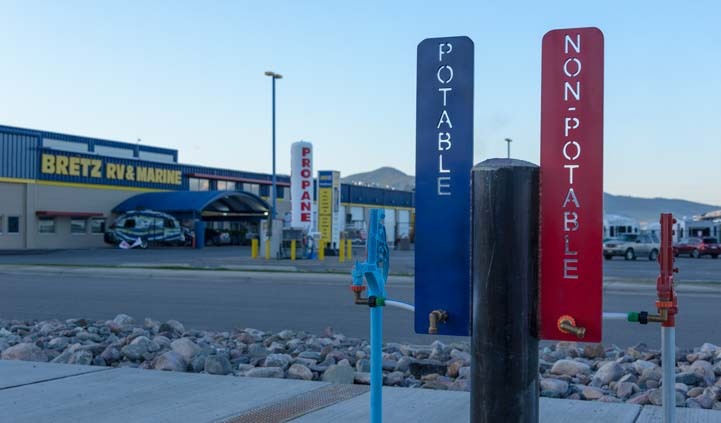 RVers who don’t dry camp at all can travel with as little as 20 gallons or so of water all together between the fresh water tank and hot water heater, or 166 lbs. of water weight instead of 664 lbs. like we have. So, what does all this have to do with our RV window shopping at Bretz RV & Marine the other day? I LOVE little trailers, and I was smitten by a sweet tear drop trailer called the Little Guy Rough Rider. The Rough Rider – How Adorable!! “I Go Where I’m Towed To” — Funny, that’s what Mark says!! We also really liked a big Redwood fifth wheel. 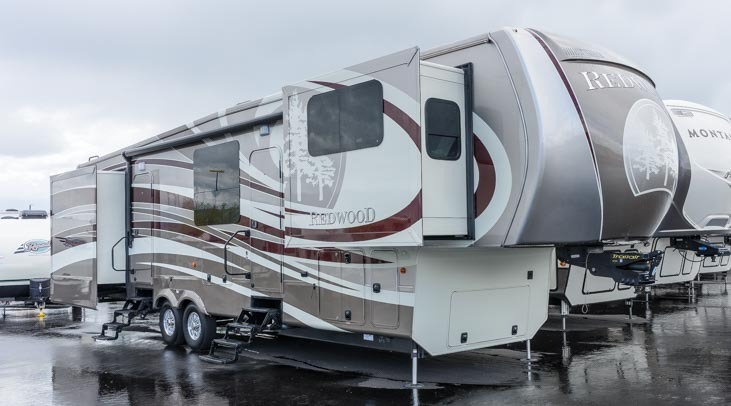 A beautiful Redwood fifth wheel trailer caught our attention. It was a monster with two exterior doors and five slides. Wow!! This big beautiful baby has two exterior doors and five slides!! 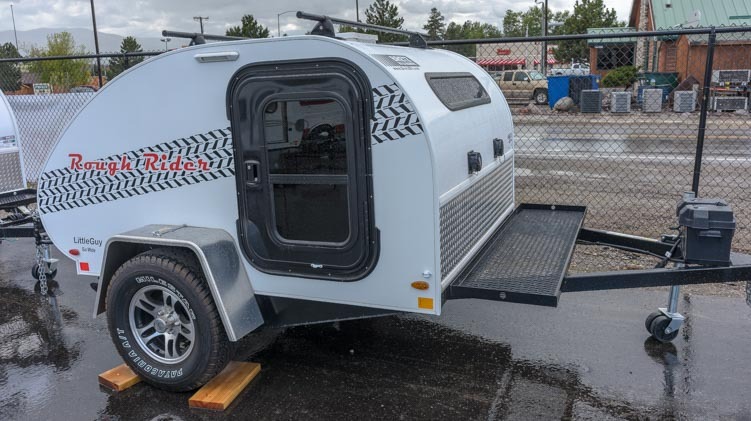 Well, which one do you think can carry a heavier load — the little weekend trailer that is just a bed on wheels with a wee mini-kitchen on the back, ideal for summer camping, or the big “full-time,” four season fifth wheel trailer that might replace someone’s house?? Ahem, not the trailer you’d think. Rough Rider Teardrop Trailer Cargo Carrying Capacity: 1,925 lbs. 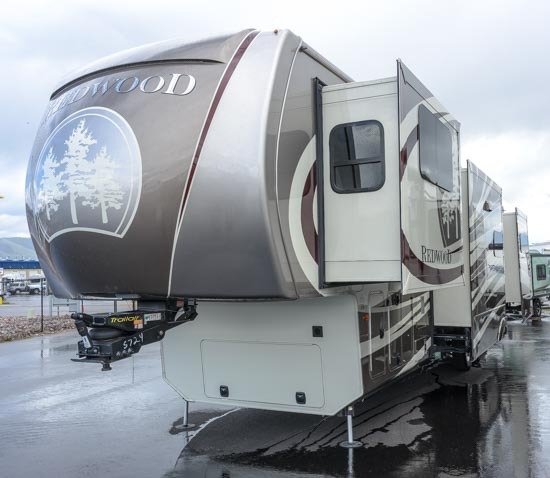 Redwood Full-timer Fifth Wheel Trailer Cargo Carrying Capacity: 1,876 lbs. 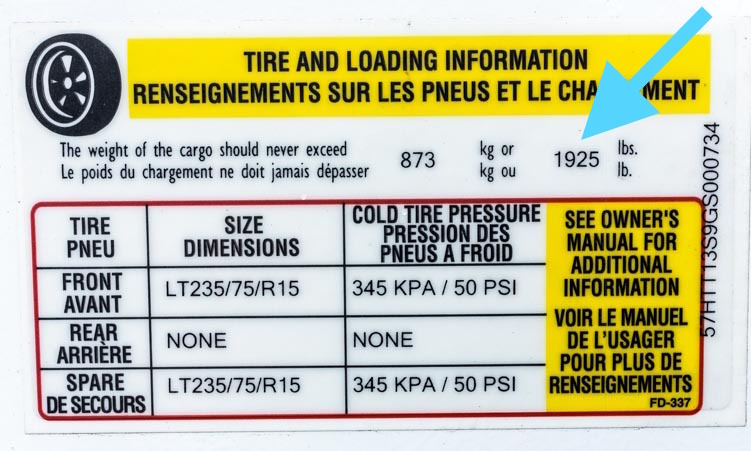 Weights capacity sticker for the big beautiful fifth wheel trailer: Cargo Carrying Capacity of 1,876 lbs. Reeling from this sticker shock, we wandered around the RV dealership lot a little more and found a wonderful big fifth wheel toy hauler. 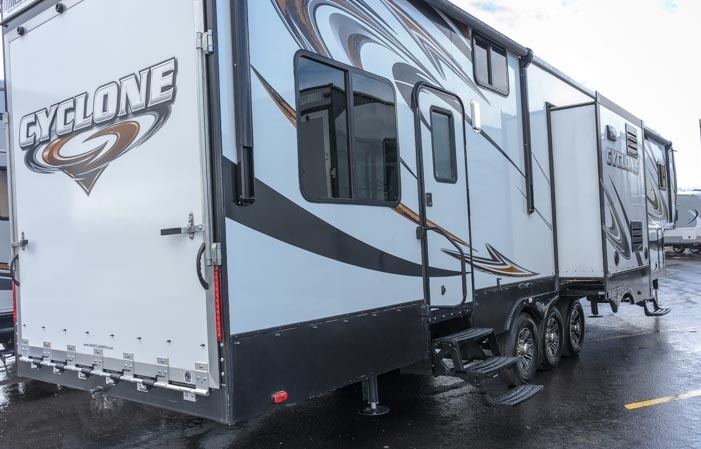 Curious about cargo carrying capacities for toy haulers, we checked out this big trailer. This triple axle behemoth had three slides and was built to carry big toys with motors, like ATVs, motorcycles, and other goodies. Three slides and three axles — ready to go do some ATV adventuring in style!! Like all toyhaulers, it had a big door in the back that would drop down to become a ramp so you could roll out on your ATV or motorcycle with ease. The back has a huge door that drops down to form a ramp so you can ride out! So this big guy was built to haul a big load, right? Well, not exactly. It has a Cargo Carrying Capacity of 2,302 lbs. That is just a little more than the Little Guy Rough Rider teardrop! 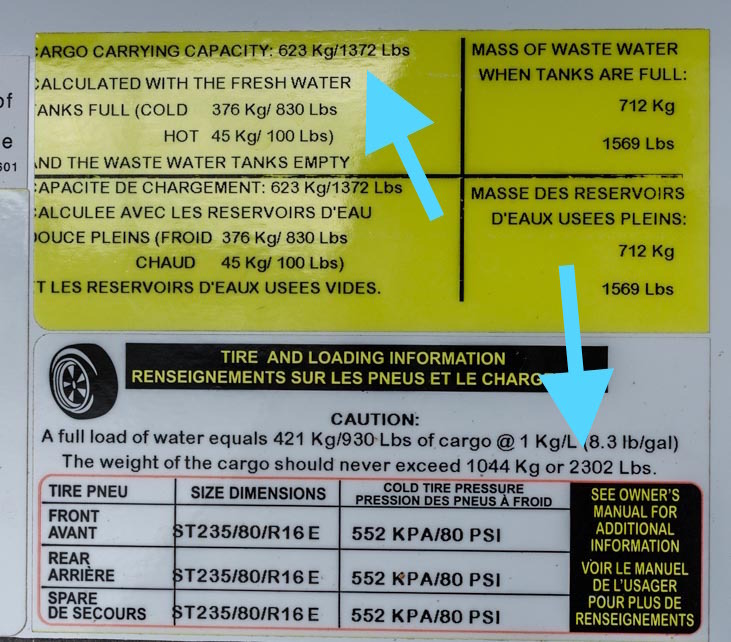 The sticker on this toy hauler makes it very clear that when the trailer’s fresh water tank and hot water tank are both full, then the Cargo Carrying Capacity drops to 1,372 lbs. So, your clothes, food, generator, on-board gas tank, propane tanks and your big toys like your ATV or motorcycle can’t weigh more than 1,372 lbs. all together if you wish to dry camp. If you are going to get hookups, then your limit will be 2,302 lbs., still a very tight squeeze if your toys weigh a few hundred pounds. 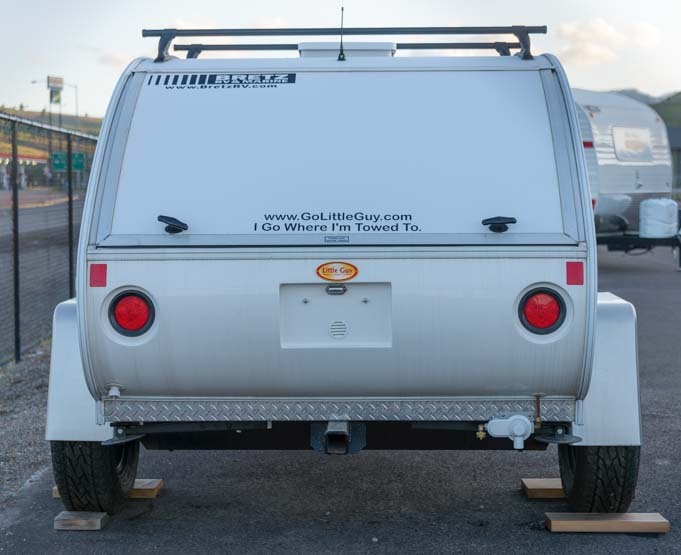 If this toy hauler is towed with empty water and waste tanks, it can carry 2,302 lbs. If the fresh and hot water tanks are full and waste tanks are empty, it can hold just 1,372 lbs. I’m not advocating one RV brand over another or knocking any particular RV brand with this info. Far from it! These specs and stickers come from random trailers that appealed to us and that happened to be on the dealership lot the day we were there. 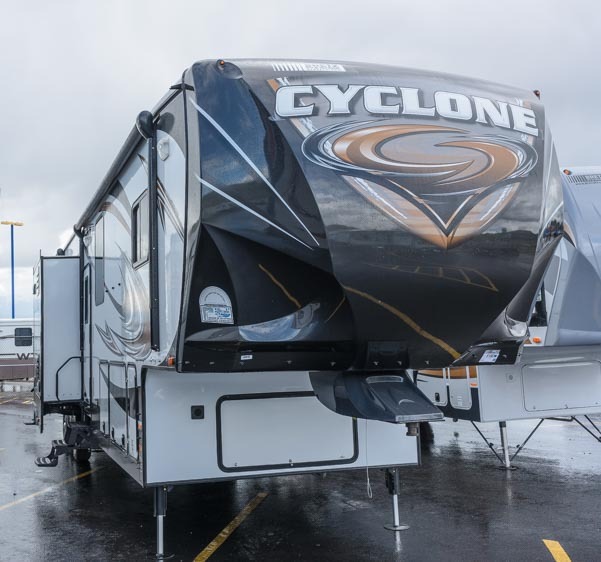 When we have wandered through other RV dealership lots in different states at other times, we have discovered that many very popular brands have similar specs. Need a pick-me-up after looking at all those trailers and calculating all those numbers? 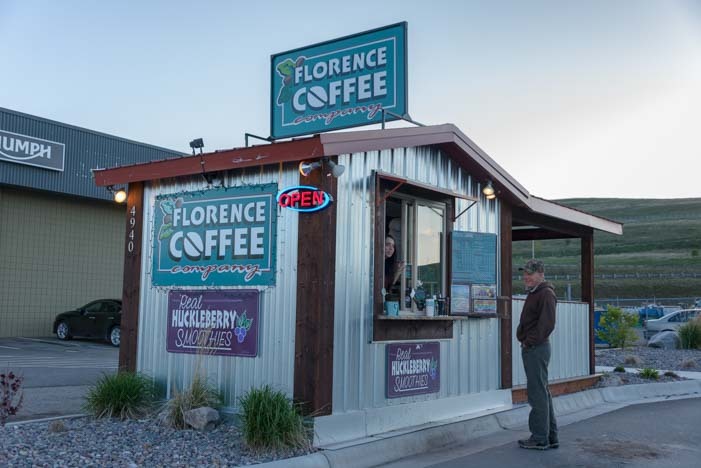 There’s a great little coffee kiosk next door to Bretz RV & Marine! 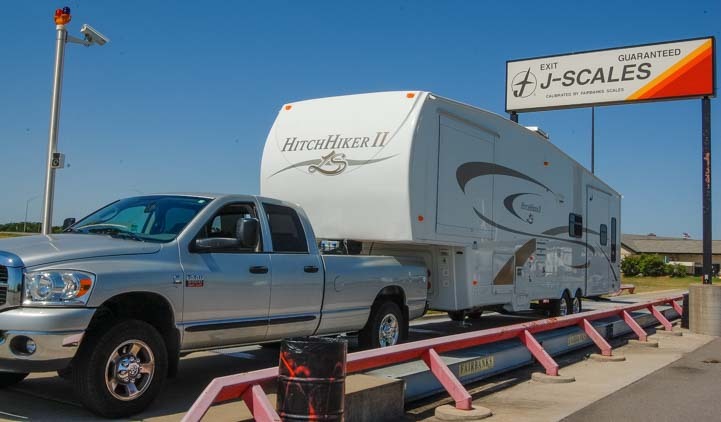 The important thing is that if you are shopping for a trailer that you are going to tow a lot, you should try to estimate how much weight you will put into it, including however much fresh water it will have in it when you hitch up. Then make sure the trailer you buy has sufficient cargo carrying capacity. Unsure what your stuff weighs? You can use a bathroom scale to get a rough estimate of what your clothes weigh by putting your laundry basket on it or weighing yourself holding your laundry basket and subtracting out your weight. You can also grab a bunch of clothes/jackets on hangers and do the same thing. Likewise after a big grocery shopping spree — weigh yourself holding bunches of bags of groceries before you put it all away. Then look at what you already have in the fridge and pantry. The same can be done with pots and pans, dishware, tools, shoes, bikes etc. And don’t forget any upgrades you plan to do to the trailer after you buy it. Or use our numbers as a guideline. We still haven’t filled all the shelves in our fifth wheel! 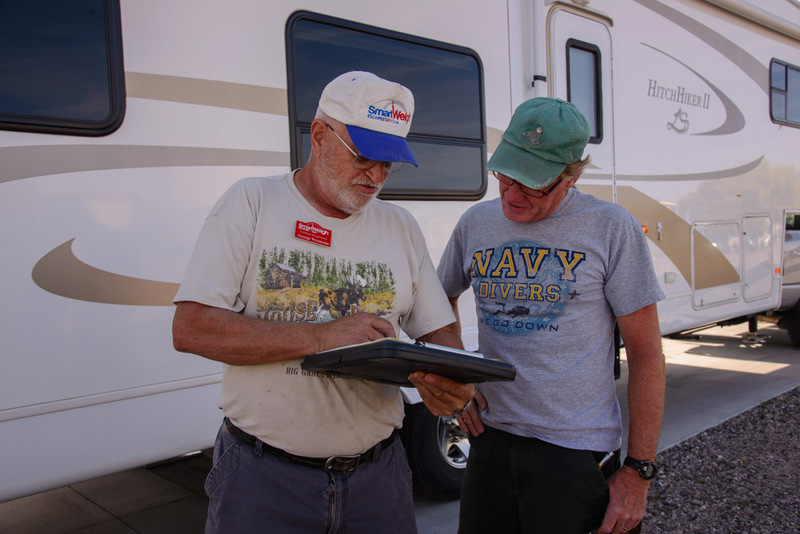 RV Tech Tips Articles - A one page index of links to all our RV Tech Tips, RV Upgrades & RV Maintenance articles. Buying a Truck - Which options turn an ordinary diesel pickup into a massive TOWING MACHINE? How to HEAT AN RV - Heating tips for those dastardly blizzards on mountaintops! Battery Charging Primer - The low-down on RV and marine batteries and how to charge them effectively. B&W Fifth Wheel Hitch - Why we chose this hitch for our fiver plus an easy 5th Wheel Hitch Installation Guide. How to change a dually truck's inner rear tire - Tips for changing the inner rear tire on a dually truck. 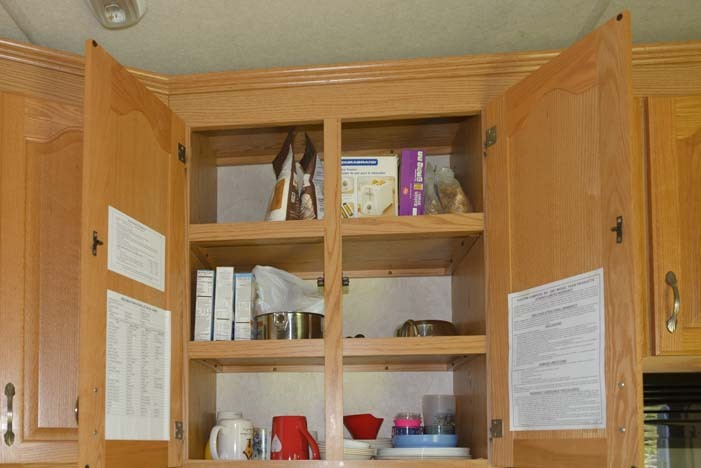 Increase Your RV Storage Space - Add precious storage space at the RV dinette with storage benches! Which Solar Panels are Best? - Which is better: FLEXIBLE or RIGID?? 12 or 24 volt?? monocrystalline or polycrystalline??? How to Defrost an RV Refrigerator in 20 Minutes - It is actually a cinch to defrost an RV fridge! Suspension Overhaul on a 5th Wheel - A Total Re-design for our Suspension: Hangers, springs, shocks & more! Can you run SOLAR POWER and SHORE POWER together? - What happens when you're on solar and you plug in? Converters, Inverter/Chargers and Engine Alternators - How do these battery charging systems REALLY work? How to BE COOL in summer! - Tips for cooling off your RV! RV Extended Warranties - Is an RV warranty a good investment or a waste of money? Our personal case history. Working and Living on the Road - How do you make money on the road and who lives this nomadic lifestyle? Sell or Lease the House? - Is it better to SELL or LEASE your house when you start a life on the road? Mexican Dentists - Are the Dentists in Mexico any good? Just how cheap are they? Here are our PERSONAL experiences. Still Smiling After 3 Days at the RV Repair Shop - Why? Our RV Warranty put us $2,000 ahead of the game! 5th Wheel Suspension Replacement - When our trailer's suspension failed, we $aved $$$ Thousands getting it replaced. RV Toilet Replacement - Our RV toilet quit flushing (ugh!) but our RV warranty saved us again. Now we're $6,700 ahead! Which RV Is Best for Full-Time Living? - Transitioning from a house to an RV - Which RV makes the best home? 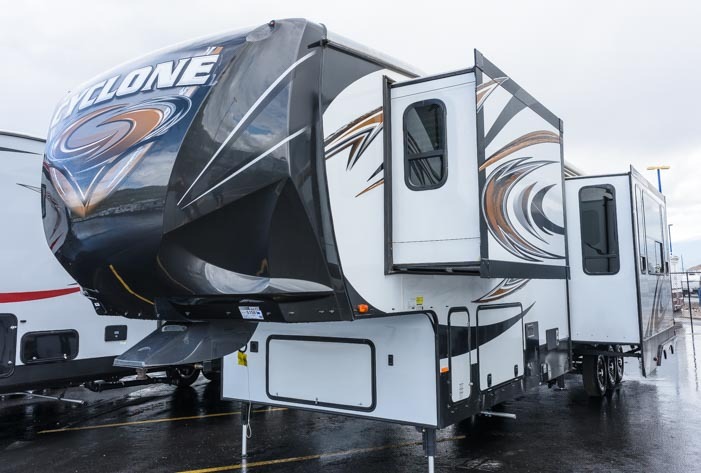 What are the MOST IMPORTANT FEATURES in a Full-time Fifth Wheel? - For anyone planning to live in an RV! Learn RVing the Fun Way!! - Go Cheap, Go Small, Go NOW and have a blast in little RV! Glimpses of the Full-time RV Life - Anecdotes from the road and essays about living the RV dream. Travel Photography Tips! - All the cameras, gear, books, blogs and tools we used to learn to take great pics! Gear Store - A list of the goodies, equipment and gear we've found useful in our RV lifestyle! This entry was posted in The Full-time RVing & Cruising Lifestyles and tagged Full-time RV Lifestyle, New, Non-Travel, Truck Trailer Hitch by Roads Less Traveled. Bookmark the permalink. Great story. Cargo weight seems to grow while we are sleeping. Before you know it, that skimpy 800 pounds we started with, has expanded to 1600 pounds. Thank you for pointing out how little cargo capacity is available in most RV’s and how we overload what is available. From now on, I will be more aware of cargo weight than the floor plan. I don’t full-time, but I still carry a lot of gear. Things can happen no matter how short or long the trip, especially if you are overloaded. You are so right about that cargo weight growing while we sleep!! And also that being overloaded is a concern for anyone towing a trailer — absolutely!! Thanks for the pat on the back and enjoy your travels. You’ve got a great logo!! Good read! I love the Redwoods, they are made so well, but that cargo capacity sure was a suprise. I tell ya, lots of homework to do before purchasing! I love all the big cushy fifth wheels too — so pretty and comfy!! It is startling that so many are built with very little cargo carrying capacity. With any luck, some manufacturer decide to specialize in high end trailers that are built to carry a real household safely and will carve themselves a special niche in the market!! A good read for sure. I found your blog during my research for a new truck. I also blog a little (https://painthousetexas.wordpress.com), although I have been lax in doing so lately. I can appreciate your creative blending of your sense of humor and pertinent information. BTW, we presently own a 2012 MegaCab Longhorn 4×4 SRW Cummins. I am stepping up to a 2016 Megacab Longhorn 4×4 Dually, with the Aisin transmission. Your blog on the buying process was very well done and informative, even for a ‘car guy’ such as myself. I’d be curious to know what kind of economy (ha!) you get with the new truck? We tow a 36′ gooseneck car hauler when we show off our work (show cars) around the country and are looking to start traveling more for fun in a 5th wheel. Keep the “how to” stuff coming! Fuel economy? What’s that?? LOL!! We were getting 9.5 mpg more or less while towing until we installed our new Edge Juice with Attitude tuner a few hundred miles back. That has bumped it up by a mile per gallon, more or less (blog post coming). Thanks for appreciating my info about our truck buying process. That’s really nice for a gal to hear from a “car guy” (although I owe whatever I know to my “car guy” hubby who has patiently taught me a ton of stuff!!). You might get a kick out of two awesome car races we’ve seen on the open road in our travels – the Sun Valley Road Rally and the Nevada Open Road Challenge! Our 2007 24-5N Artic Fox has a Net Carrying Capacity of 4’880 lbs – not 5’000 but pretty close. The 2016 Northwood Arctic Fox 29-5K has a Net Cargo Capacity of 5,392 lbs. The lowest Net Cargo Capacity of their current Arctic Fox 5th wheels is 3,509 lbs. Arctic Fox is one of the few mass market fifth wheel builders that understands just how much stuff long term travelers have with them in their trailers. Like all builders, their cargo carrying capacities drops off as the units get longer (probably because the same size frame is used across several models). Sure wish they made more floor plans and had gelcoat exteriors (although that probably adds a bunch of weight!)!! If you go fully custom, of course, you can specify exactly how much payload capacity you want/need. During your travels have you seen any of these models? If so do you have any options or advice on this company and their fifth wheels? Take the GVWR, then add in the weight of all the factory installed options that are included in the model you are buying, then add the weight of full holding tanks (fuel, water, waste grey water, waste black water, propane), then add the weight of other gear that will be added (batteries, solar etc. ), then add the weight of the toys that will be placed in the garage, then add the weight of food, clothes, etc. If the number you end up with is within spec, you are golden. In the example given, of the 6,000 lb of cargo carrying capacity, if the fresh and waste water tanks are full, then there is only 3,040 lbs. of capacity left for everything else, from factory installed options to the toys that will be hauled to food, clothing, etc. One of the popular factory installed options is fuel tanks for a generator and for toys (motorcycles/ATVs). If the unit being purchased has that option, then another nearly 400 lbs. must be deleted from the cargo carrying capacity, leaving less than 2,700 lbs. for everything, from other factory installed options, to toys hauled in the garage to food and personal gear. Electronic maps are great, but planning a route on secondary roads is easier with a detailed atlas. We have a Delorme (left) and/or Benchmark (right) atlas for every state we visit. Find more of the goodies we use in our Gear Store!